This Quick and Easy Vegetable Lasagna is a light and fresh way to take advantage of seasonal produce in a comforting, one dish meal! This Quick and Easy Vegetable Lasagna is a light and fresh way to take advantage of seasonal produce in a comforting, one dish meal! Loaded with veggies and full of whole grains and protein, this nourishing dinner is a simple and delicious dinner to fuel your family! I know that I’m not the only mom out there who faces a regular dinnertime battle when it comes to veggies. While my kids have certain vegetables that they enjoy, it can often be a challenge to encourage new or different options. And if there’s one thing that I’ve learned after raising three boys, it’s that combining vegetables with pasta or a cheesy casserole is always more appealing than plain, raw produce on a plate. I’m not “hiding” the vegetables or “sneaking” them onto a plate, but instead celebrating the delicious flavors and textures by preparing them in familiar ways. My mother-in-law makes a great beef and sausage lasagna that she serves every year at Christmas. My boys go crazy for her decadent dish! 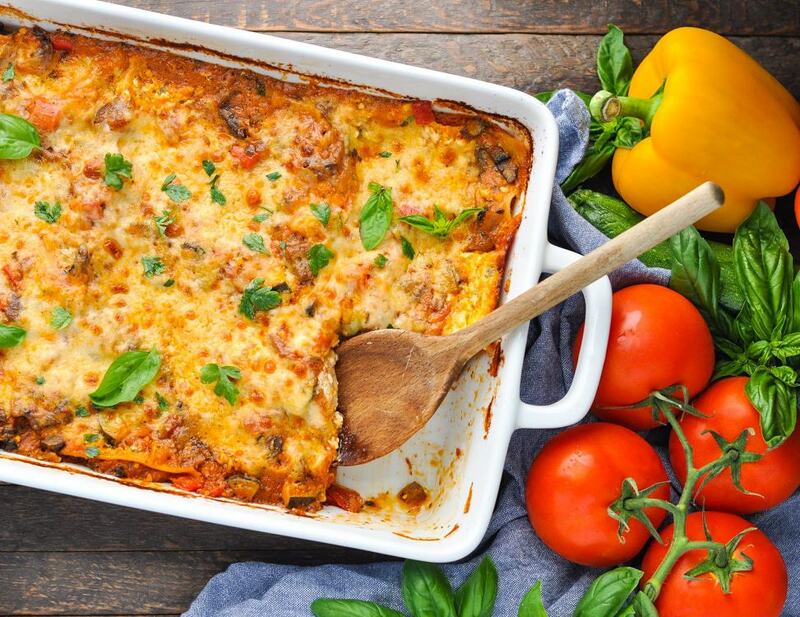 So when I was trying to think of a good way to take advantage of so much fresh, affordable summer produce, I instantly dreamed up this fully-loaded Vegetable Lasagna that’s so cheesy, so flavorful, and so satisfying that even my carnivorous husband cleaned his plate without complaint! I promise…you won’t miss the meat! 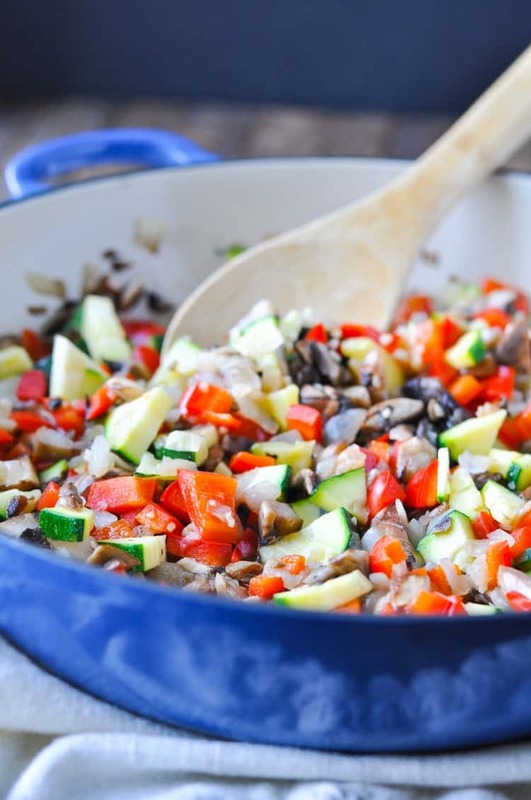 I used a combination of chopped red bell pepper, sliced mushrooms, diced onion, diced zucchini, and minced garlic since that’s what’s readily available right now. The good news is that you can mix it up and modify the recipe to include any of your family’s favorites. Corn, diced eggplant, or spinach would all be great additions. In the fall, I’ll probably go with some butternut squash and kale! The vegetables are sautéed in a skillet for about 3-5 minutes, just until they’re nice and tender. Pour in a jar of your favorite homemade or store-bought marinara sauce and the base of your lasagna is ready! What really turns this veggie-full meal into a total comfort food dream is all of the rich, creamy, melted cheese! Because there’s no such thing as lasagna without the cheeeeeeeese! I choose Horizon Organic cheeses for my family, and the shredded mozzarella and cottage cheese both work beautifully in this dish. 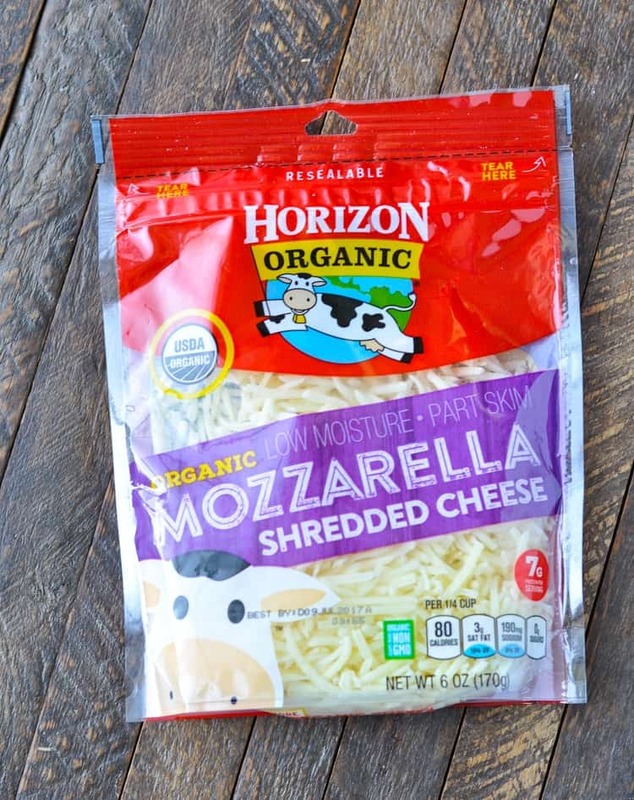 The Horizon products are made from organic milk, so I get wholesome ingredients that also taste delicious. 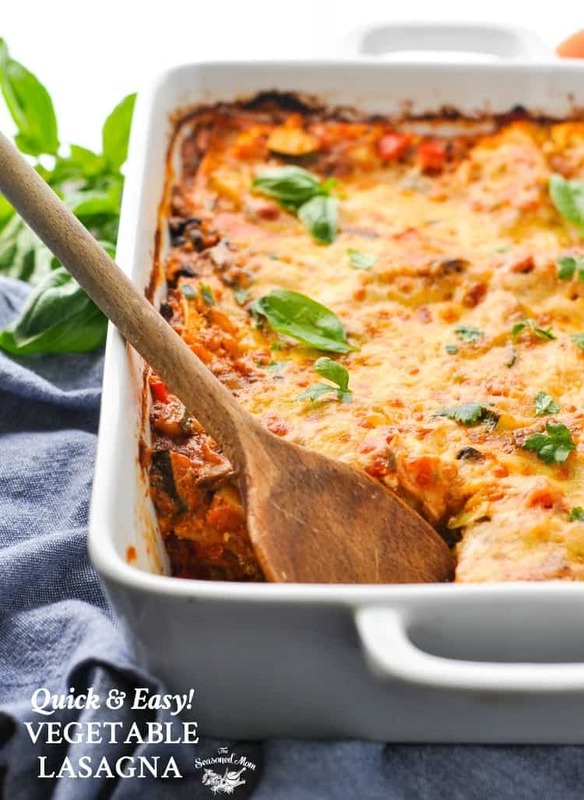 Did you know that you can use small curd cottage cheese as a lighter substitute for ricotta cheese in lasagna recipes? Horizon’s organic cottage cheese is high in protein and has the added benefit of live and active cultures. 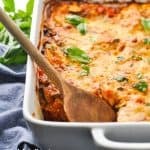 I combine the cottage cheese with Horizon’s organic shredded mozzarella, Horizon’s organic eggs, Parmesan cheese, and fresh Italian herbs for a lasagna filling that packs a flavorful punch. It’s a great way to use up some of that bountiful basil that’s currently overtaking our garden, too! When the cheese filling is ready and the veggies are cooked, it’s time to assemble the lasagna. Pro tip: I’m a big fan of the organic, whole wheat oven-ready lasagna noodles that I don’t even have to boil before baking. 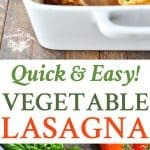 Skipping that extra step makes this Vegetable Lasagna truly quick and easy! After about 45 minutes in the oven, you’ll be greeted with a bubbly, golden brown, cheesy casserole and a kitchen that smells ah-mazing! My boys seriously LOVE this meal. 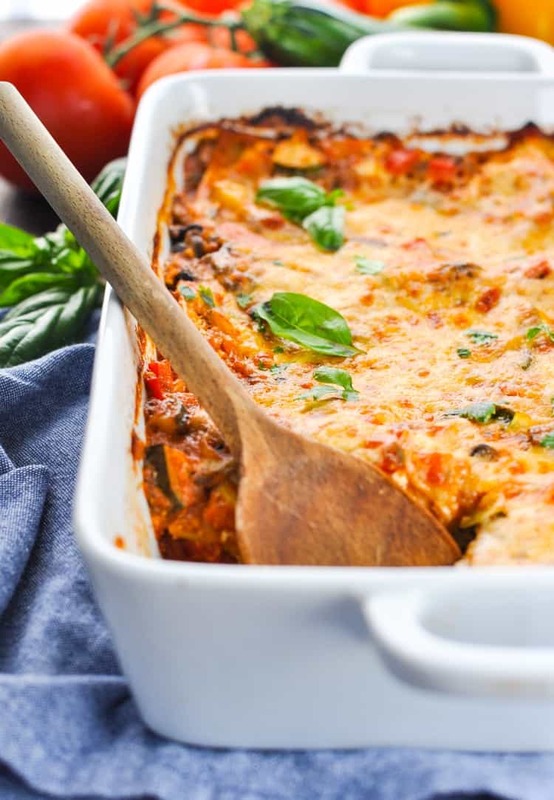 The Vegetable Lasagna is a wonderful way to encourage our kids to enjoy more vegetables, while also showing them that healthy living can be soul-nurturing, wholesome, and comforting. Any simple and fresh dinner that brings my family happily together around the table is an instant keeper! Cooking for Two? I would suggest dividing the full recipe between two smaller 8-inch square baking dishes. That way you get two meals with the same amount of effort! Alternatively, you can cut all of the ingredients in half and prepare one lasagna in an 8-inch square dish. Want to Prep Ahead? This is a great freezer meal! You can freeze it either before OR after baking. I usually freeze the lasagna after I assemble it, but before baking (just my preference, because then it’s only baked once). Be sure to thaw the lasagna in the refrigerator overnight before baking. Then proceed with baking instructions above. Preheat oven to 450F (230C). Spray a 9 x 13-inch baking dish with cooking spray and set aside. In a large skillet, heat oil over medium-high heat. 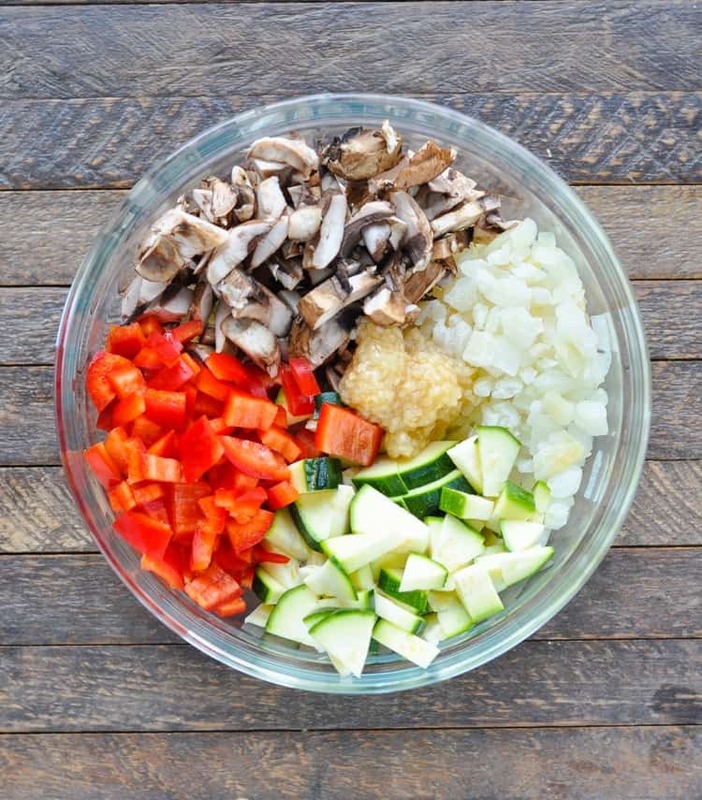 Add mushrooms, zucchini, bell pepper, onion, and garlic. Cook and stir the veggies just until tender (about 3-5 minutes). 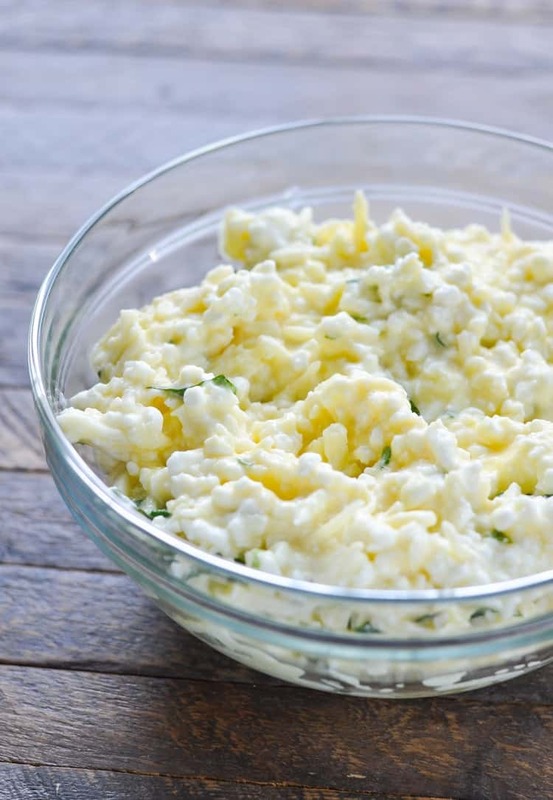 While the veggies cook, use a separate bowl to stir together egg, parsley, basil, cottage cheese, 1 ¼ cups mozzarella, and ¼ cup Parmesan. 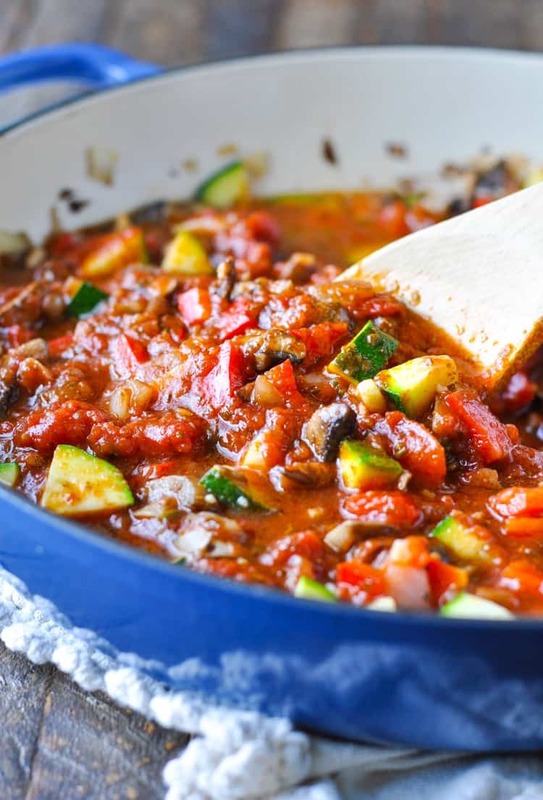 When the vegetables are done cooking, stir the marinara sauce into the skillet. 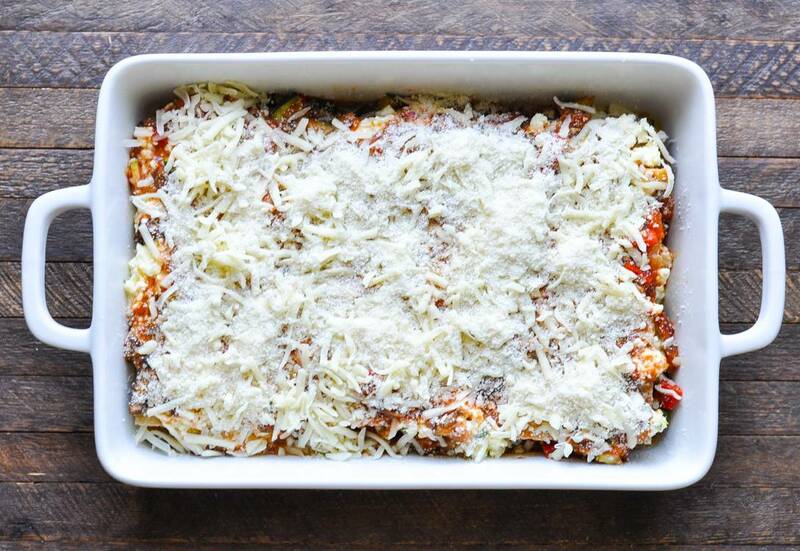 Spread 1/4 of the marinara-vegetable sauce mixture in a thin layer in the bottom of the prepared baking dish. Top with 3 no-boil lasagna noodles, 1/3 of the cottage cheese mixture, and another 1/4 of the sauce mixture. Repeat layers two more times. Finish with remaining 1 ¼ cups of mozzarella and ¼ cup of Parmesan cheese on top. Cover with foil sprayed with cooking spray. Bake for 40 minutes. Remove foil, and bake for another 10 minutes (or until heated through and cheese on top is browned). Let stand for a few minutes before slicing and serving. Want to Prep Ahead? This is a great freezer meal! You can freeze it either before OR after baking. I usually freeze the lasagna after I assemble it, but before baking (just my preference, because then it's only baked once). Be sure to thaw the lasagna in the refrigerator overnight before baking. Then proceed with baking instructions above. Previous Post: « London Broil Marinade for the Grill or Oven! what a great recipe…tried it once and loved it…on the table for a dinner party tonight! Prepping heaps of freezer meals for postpartum enjoyment and this made the list! Turned out wonderfully! Used uncooked noodles instead of no-boil, doubled quantities, added LOTS of spinach (kale or chard would work too for extra greens), whole milk dairy instead of low-fat (better for Mama & Baby), red chili flakes cooked at 375ºF for one hour, covered with aluminum foil instead of 450ºF for 40 minutes, and it did the trick— cooked everything inside and out perfectly! Time to portion out and freeze, thanks so much for the delicious recipe! I made this last night , my small town grocery store only had green bell peppers available so I had to use that instead and used ragu’s new homestyle sauce and it turned out wonderful . Had two pre teen girls eat all they could !!! This will be a great to at our house ,thank you !!!! How many servings are in this recipe? Hi, Janet! The servings are listed in the recipe card above. 🙂 The lasagna serves 8 people. Enjoy!